A Silent Dinner Party is happening in New York City, on Monday August 6th at 8.30 pm. Yay! The event is supported by Splatterpool Artspce and will be held in their hybrid art and living space in Williamsburg, Brooklyn which has in the past been host to many an underground dinner party, so it’s nicely warmed up. Check them out. The menu will be summery vegetarian delights in a cook by colour sensibility :: bright, light and complex to match the days here and combat the swelter. Places at the table are limited and reservations are necessary. You can book by phoning +1 347 707 9612 or emailing honi@hedonics.com.au. The event is $25 a person including the meal, and all proceeds go to supporting the new and wonderful Bedford Baking Studio on Bedford Ave in Williamsburg where the coffee is second to none! If you can’t afford a ticket but would like to come, you’re welcome to help on the night, just holler. See ya when I’m not talking to ya! The Silent Dinner parties are heading to New York City and Mexico City in July and August 2012. The word is now out for potential hosts! If you are interested in hosting a Silent Dinner with me in your home, drop me a line real soon. If you would like to come to one in any of these cities, drop me a line as well, and I’ll be sure to keep you posted, otherwise just check back in here on the attend page in the coming few weeks as times and places get decided. … writing menus today with Owen and Helena. Looks like we’re around 15 people. If you haven’t secured your place, text me today! Looking forward to going to the giant palm on the water! There’s a lot of sand in Dubai! During the month of January, the fabulous Zico house in central Beirut has a focus on Australian art supported by the Australian embassy in Lebanon. 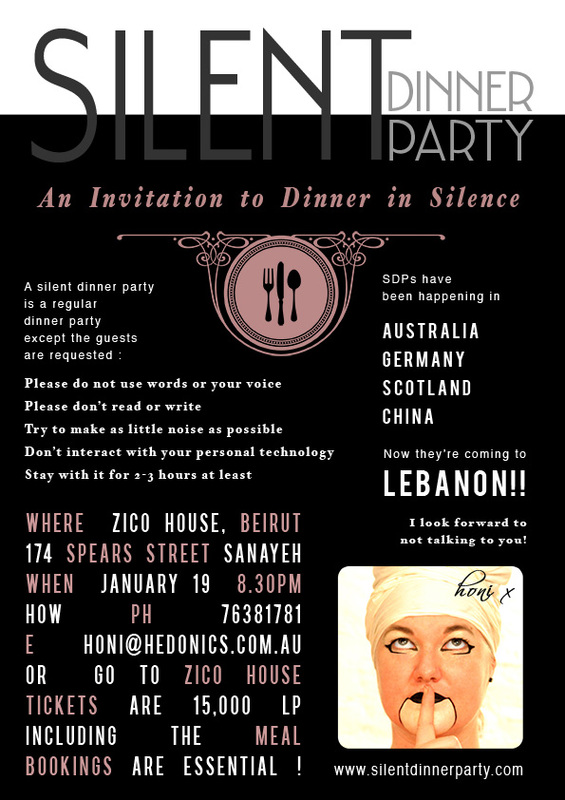 As apart of this, a Silent Dinner Party is set to take place at the artists residence at Zico House on Jan 19th from 8.30 pm. We are now taking bookings, so drop me an email if you would like to come. I will need to be in touch with all guests before the night, to find out if you have any food allergies or dietary requirements. The event is ticketed and costs 15,000 LP or $10 USD and you can get your tix over email. As always, if you would like to come and help out instead of buying a ticket, wonderful, give us a holler. Myself and the wonderful Ms Dei El-Ayoubi will be hosting the event with the help of Zico. It’s going to be a blast. The food in Lebanon has been aMaZiNg so far, I can’t wait to get amongst it in the kitchen with Firas from the good food collective. There’s lots of space at Zico’s so we can host more than normal for this one! I can’t wait ! ! What a great city too! Silent Dinners head to the Middle East! Exciting news, the Silent Dinner parties will tour in Beirut and Dubai in January 2012. There are some pretty exciting host venues on the horizon – and some skeptical locals thinking that it just aint possible to be quiet for that long!! Even suggesting that I impliment fines for people who talk!! ha! That’s one of the funniest things I’ve ever heard. The SDP requests are ‘requested guidelines’, not even rules let alone laws punishable by fines, but hey, should prove for some colourful dinner bonanzas. Colour doesn’t make noise, does it?